At 3 a.m. on July 31st, 2008 unknown assailants sprayed Jonathan Legaria Vargas’ car with over 150 bullets, killing him instantly but sparing his two passengers. 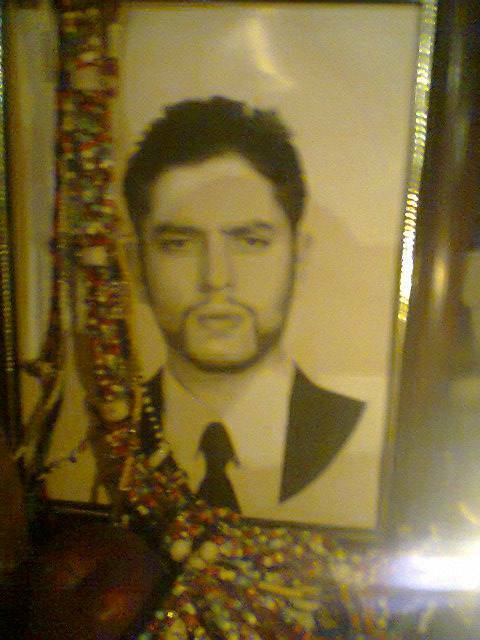 Known as both “Padrino (Godfather) Endoque’ and “Comandante Pantera,” Vargas was a charismatically outspoken leader in the growing public devotional tradition surrounding Santa Muerte. 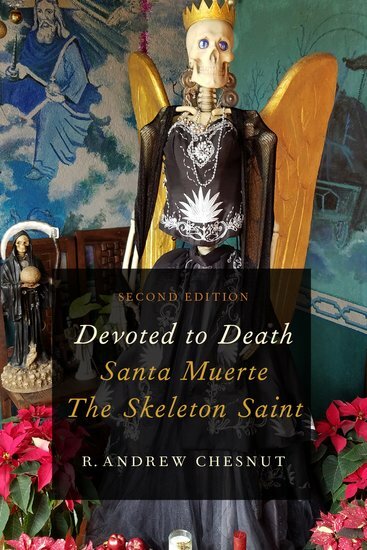 With the creation of a towering 75 ft. tall effigy of The Bony Lady in Tultitlan on the gritty outskirts of Mexico City, he was on his way to becoming a centralizing figure in the loose knit community of Santa Muertistas. Vargas made a promise to Saint (Death), “You turn over his killers to me, and I’ll try to to take you the greatest heights.” The once devout Catholic, who had always been uncomfortable with her son’s fervor for Santa Muerte, pledged she would devote herself to tending to devotion to Santa Muerte if the Powerful Lady (one of her myriad monikers) would bring justice to the murderers that took her son’s life. Events over the ensuing months transpired, such that Vargas felt that Saint Death had fulfilled her end of the bargain, and since then, Godmother Vargas has tended to the Tultitlan shrine with vigor. Since her son’s death, Godmother Vargas has kept up the pace developing the Templo de Santa Muerte in Tultitlán into one of the most vibrant hubs of veneration of Saint Death. She continues to build the community through regular worship services, television and radio appearances and digital outreach on Facebook. Under her guidance, there are even exorcisms, weddings and christenings now being performed at the temple. The shock of his murder led to years of soul searching, and the publication of ¿Quién mató al Comandante Pantera? Who Killed Comandante Pantera, a book which details her struggle to seek justice. Her poignant question, Why do we moms have to do the job of the authorities? ¿Por qué las mamás tenemos que hacer el trabajo de las autoridades?” echoes the struggle of so many facing the violence and terror that plague Mexico. Even without official support Enriqueta Vargas fought to find peace with what had occurred, and through her dedication and devotion has come one of the more surprising developments since Santa Muerte’s public outing in 2001 — Jonathan Vargas has become the first canonized figure in the cult of the Bony Lady, and perhaps the first folk saint to develop out of the tradition of another one. Over time Godmother Vargas has reported a series of visions of her son acting as an intercessor and intermediary for Santa Muerte, and other devotees associated with the temple have reported similar experiences and miraculous events surrounding him. The ritual necklaces that he wore have become a symbol of faith and spiritual power. They were with him at the time of his murder, and since receiving them, Godmother Vargas continues to wear them at every service she oversees. 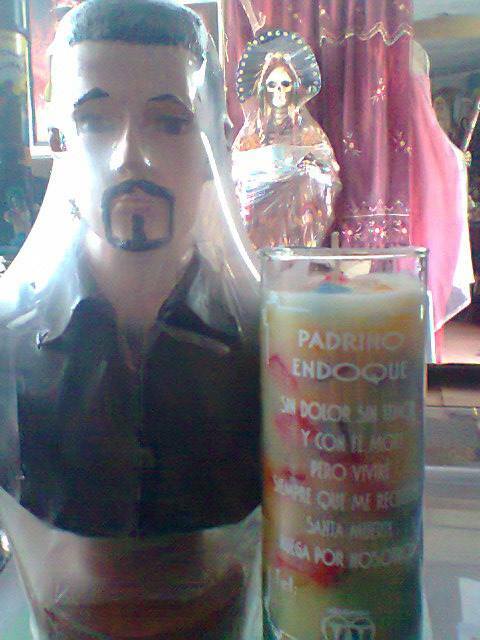 For many believers, “Padrino Endoque” has grown to represent the ideal Santa Muerte devotee for Santa Muertistas to emulate. His passion, drive and focus on faith beyond religion or politics embodies the open acceptance of Saint Death herself. Special thanks to Enriqueta Vargas, Santa Muerte Internacional, and Enrique Hernandez Garcia for the images included in this article. “…and perhaps the first folk saint to develop out of the tradition of another one.” Fascinating, thanks.